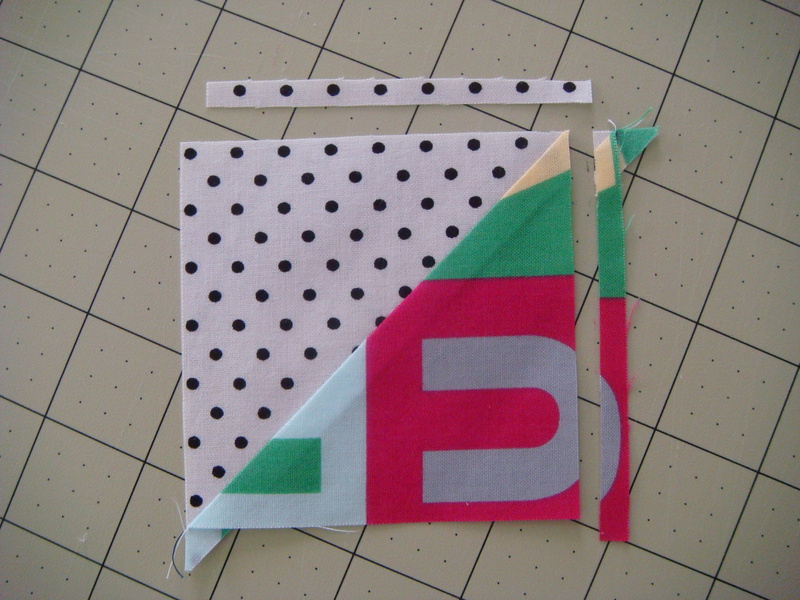 When I made my Swooning for Baby Charlie* quilt I decided it was time: time to get those half square triangles (HSTs) just right. I slowed down and took the time to figure out what works for me, and now I’m passing along what I learned to you. 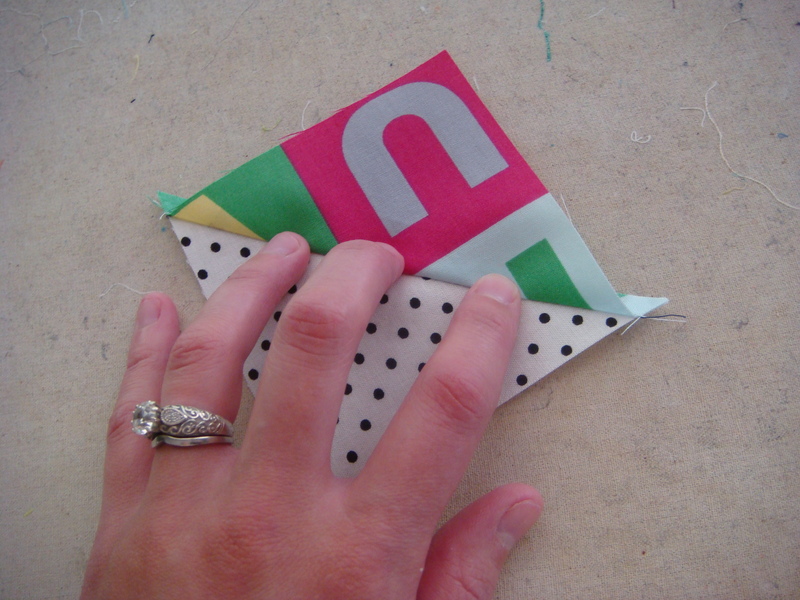 If you’re having trouble with your HSTs ending up too small, this one’s for you! 1. The math. Determine what size you need your HST to be and add 3/4 of an inch. I like to think in terms of the unfinished measurement: the size of the HST when it is a unit that is not yet sewn into your project. It will finish 1/2 an inch smaller on both sides once it is sewn into the project, but for now let’s keep it simple by just thinking about the size it needs to be when it is a lone unit. For example, the project I’m working on (writing my first pattern, in fact!) requires me to attach HSTs to 3 1/4 inch strips so I need my HSTs to measure 3 1/4 inches. 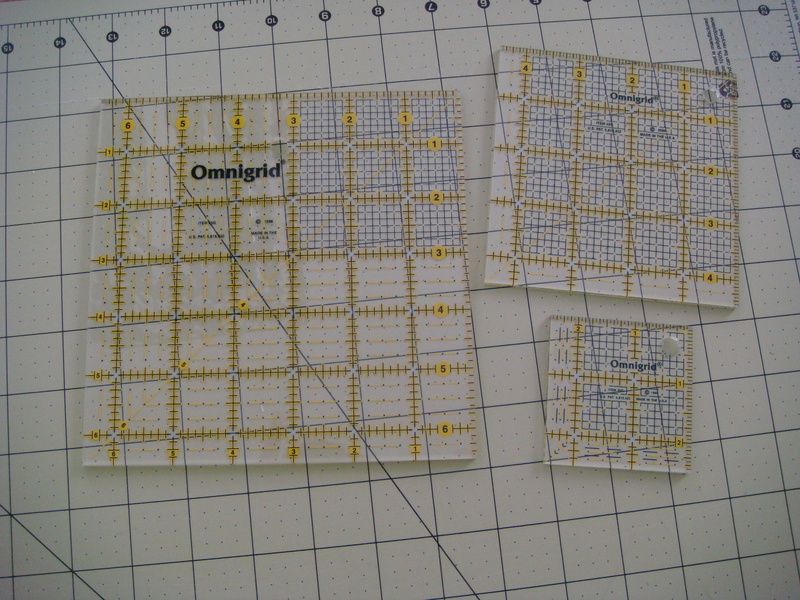 Adding 3/4 of an inch means I need to cut 4 inch squares. 2. Cutting. 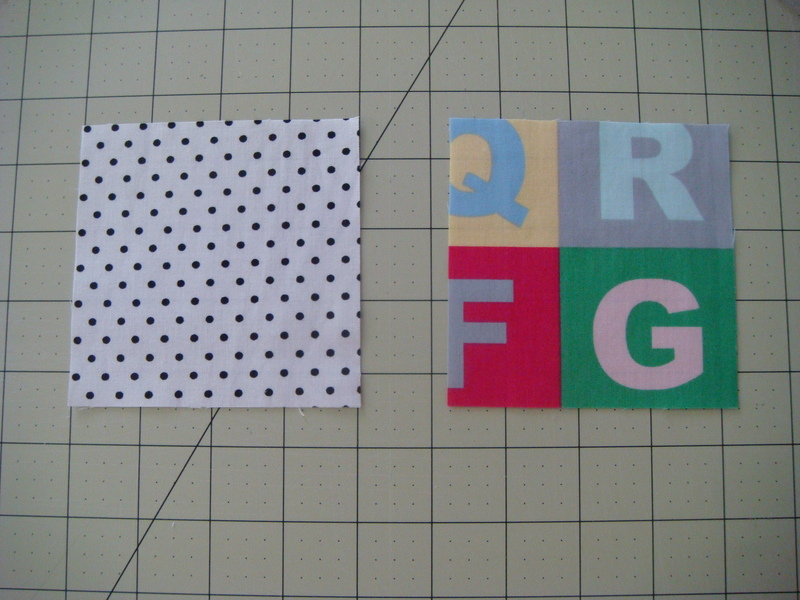 Cut a square from each of your fabrics to the size you determined in the step above. 3. Drawing. I use the Fons & Porter quarter inch seam marker for this, but I’ll show you how to do it without one too. 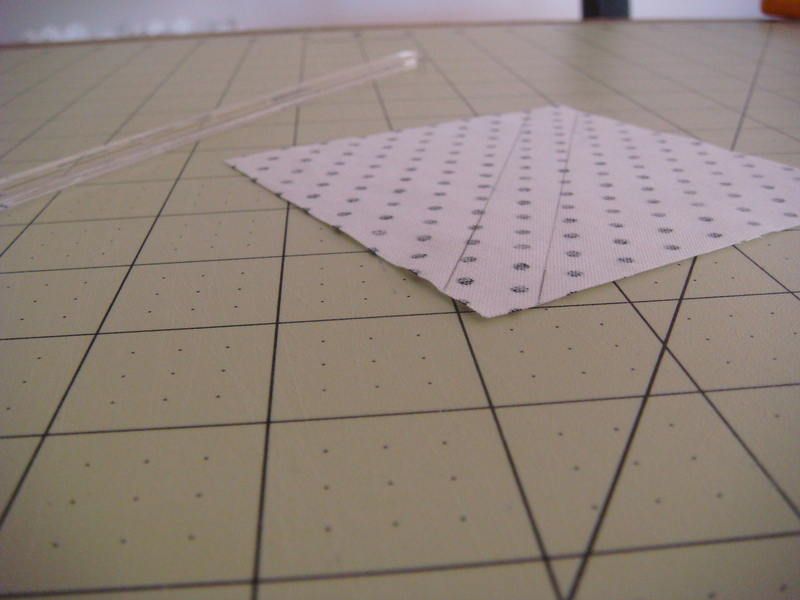 If you have the seam marker, draw 2 lines- each a quarter inch from the diagonal of your square on the wrong side of the fabric. If one of your fabrics is a lighter color, it’ll be easier to see your pencil line on that one. A mechanical pencil is the best marking tool for this job. If you don’t have the seam marker, draw one line down the diagonal of the square. 4. Sewing. The directions that come with the ruler say to sew on the lines you just drew. Don’t do that! Sew just slightly to the side of that line. This is called sewing with a scant 1/4 inch seam. 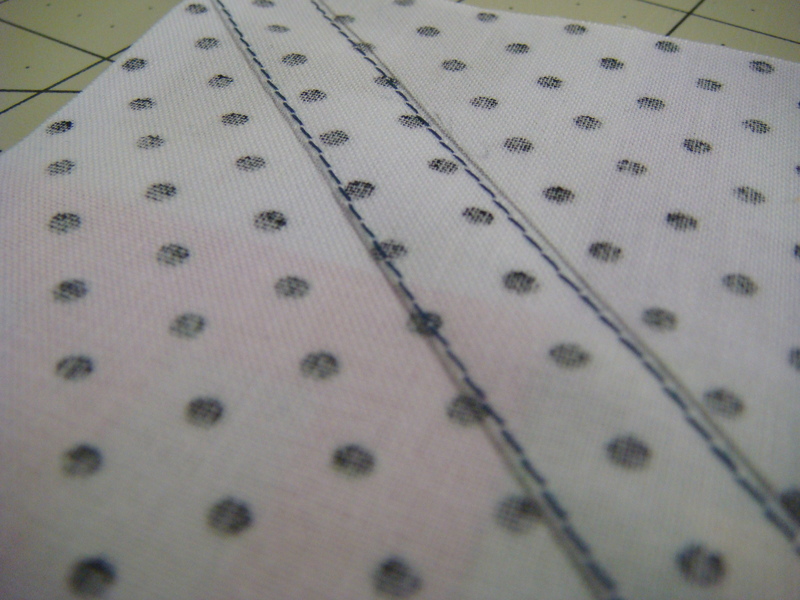 It takes into account that tiny line of fabric you lose when you fold the fabric over and press it after sewing. In our case, the over-cutting actually makes this less important because we are going to have a fair amount of wiggle room. But sewing with a scant 1/4 inch is still a good thing to practice. 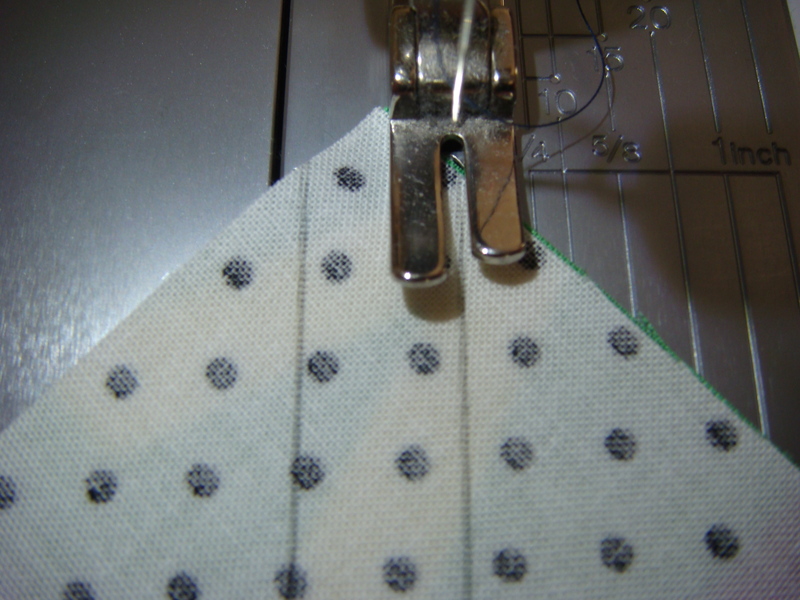 If you are only using a center line, sew a scant 1/4 inch on either side of the center line. Sew slowly here. You are sewing on the bias, where the fabric is weakest. If you zoom your machine too quickly the fabric will stretch. 5. Trimming. 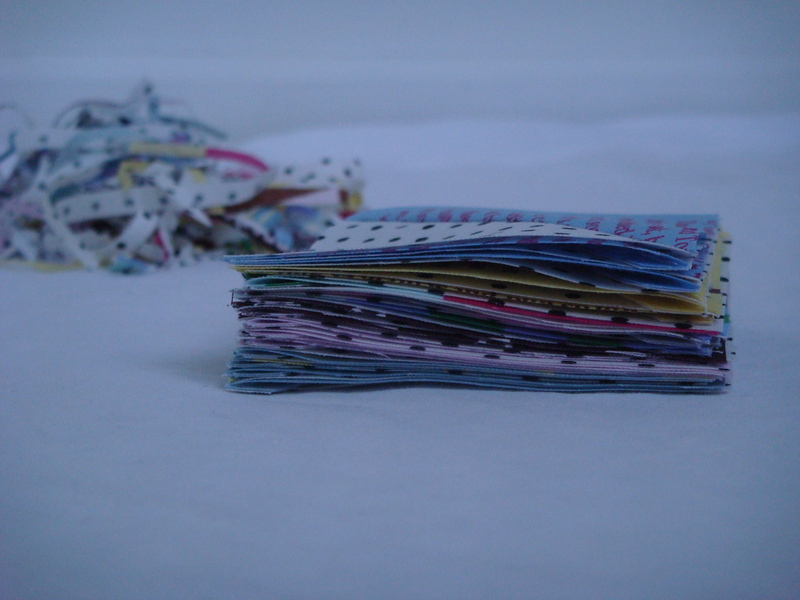 Cut and press your new baby HSTs. I like to finger press them open before pressing them with the iron, otherwise they don’t always open all the way. Yes I need a new ironing board cover. And a manicure. 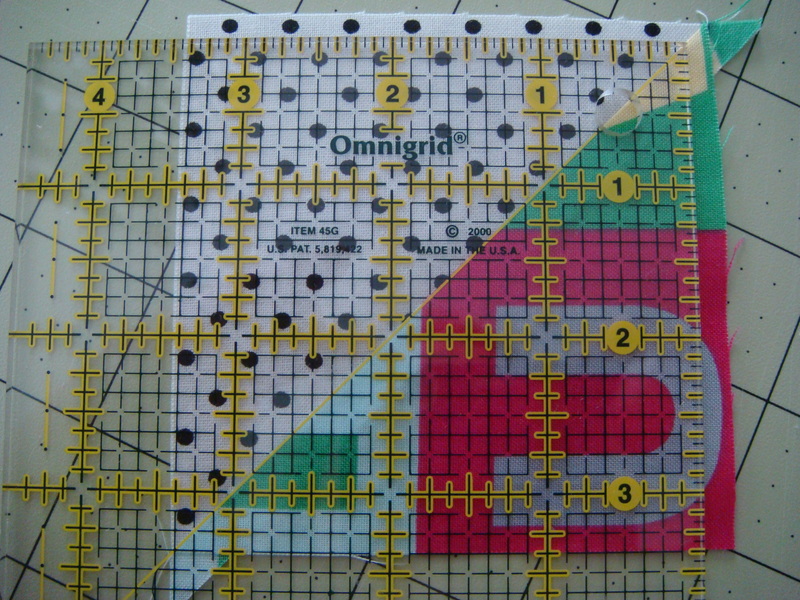 Use the 45 degree marking on your ruler to “square up” your triangles to the right size. It was a bit of an “ah ha” moment for me when I realized that a triangle can be trimmed to any size as long as you keep the ruler’s 45 degree line right on the triangle’s 45 degree line. 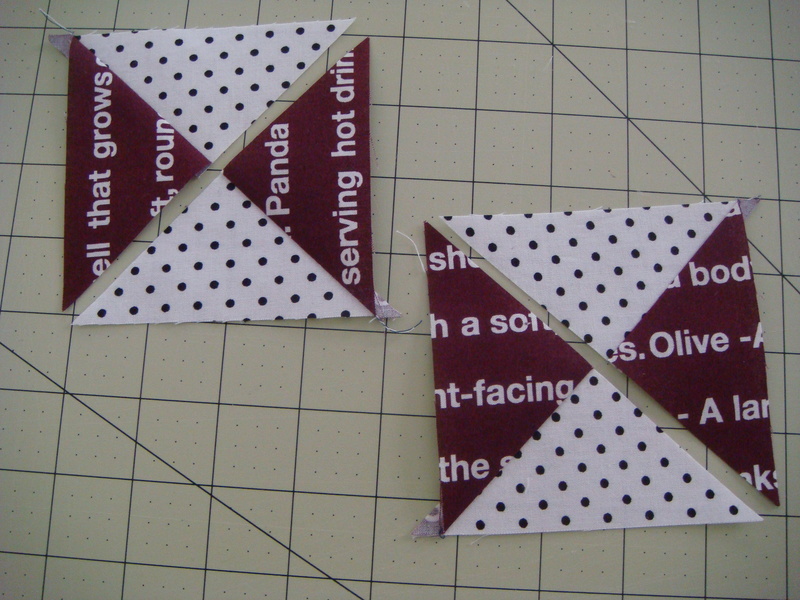 That means if you are following a pattern, when it comes to HSTs you don’t have to be nervous about changing the cutting directions a bit to allow you the extra you need for trimming. You can cut the size you want to cut! 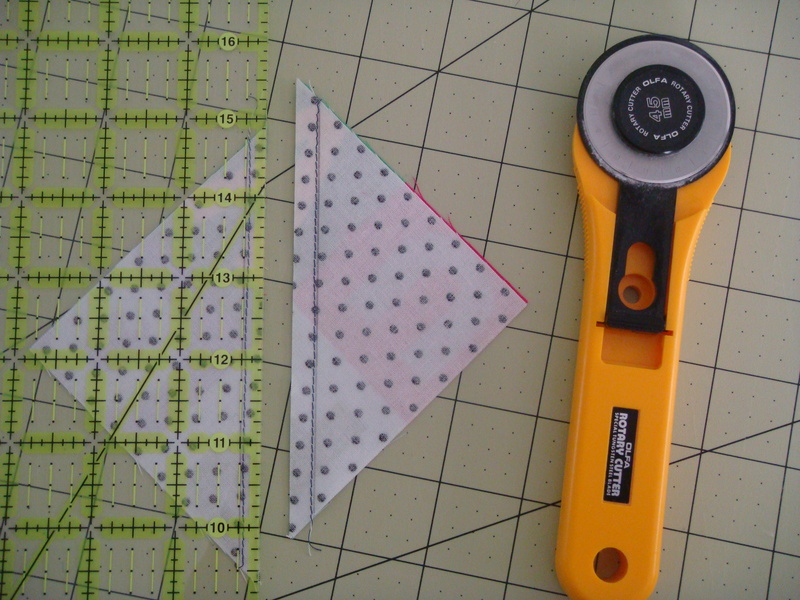 This is a little easier if you have these cute little square rulers, but you can certainly use the 45 degree angle of any cutting ruler. 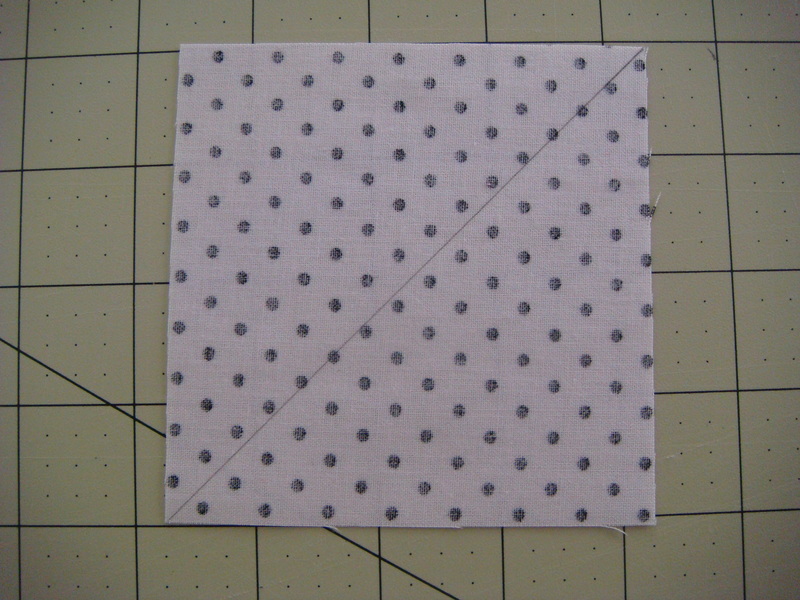 Now you have a perfectly perfect HST and you can make just about 75% of all quilt patterns! A word about the waste. Ok, so those little tiny strips of fabric can be pretty hard to part with when the fabric is this cute. But it’s worth it! 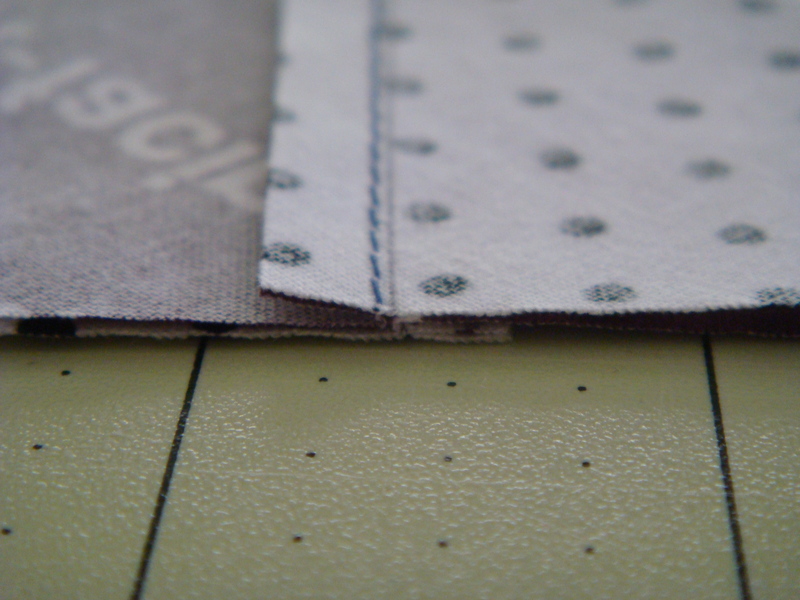 The main reason you want those little edges gone is because you’ve just sewn on the bias. 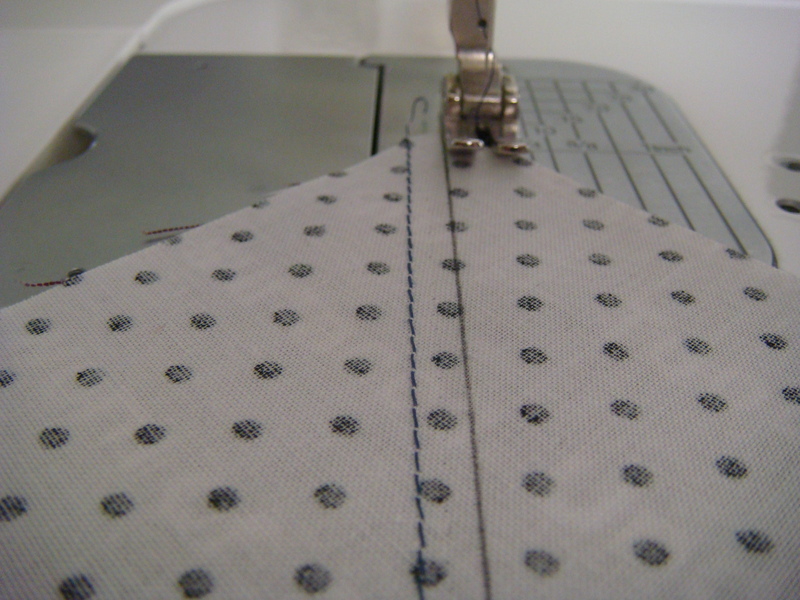 Any time you cut or sew diagonally across fabric (even if you go slowly) it stretches and weakens. Those edges were manhandled by your sewing machine’s feed dogs. It’s best to part with them in favor of a more accurate quilt top. 6. Hourglassing. (I just invented a new verb. “Mommy’s hourglassing, I’ll be there in a minute.”) If you need hourglasses instead of HSTs the process is very similar. The math: add an inch to the size of the unit you want. Just like the HSTs, you can always trim an hourglass smaller as long as you watch the 45 degree angles and the center point. I want my hourglass unit to measure 3 1/4 inches. 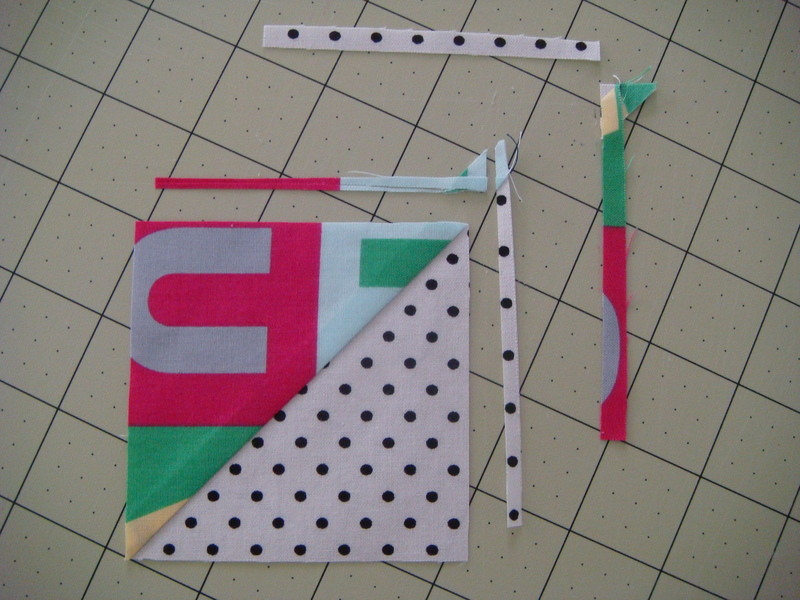 Unfortunately, we cannot use the HSTs we just made because those will end up too small. 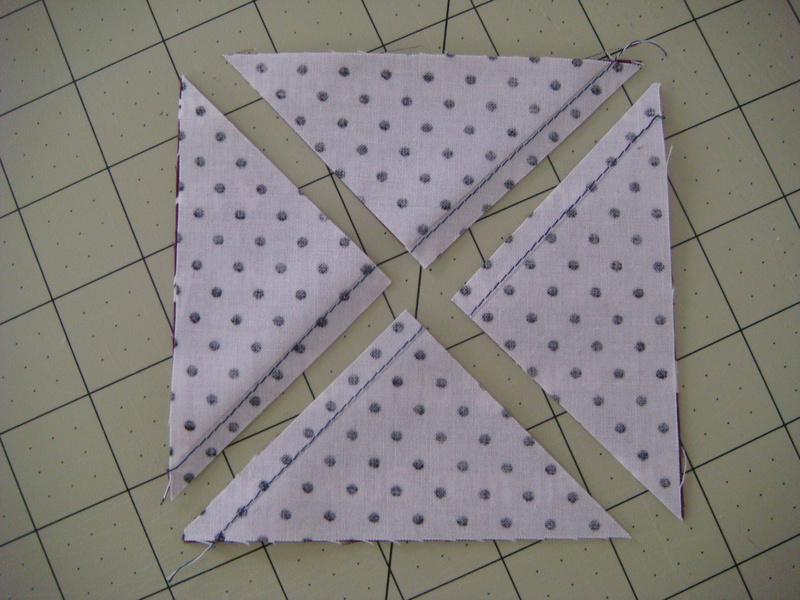 We need to cut our squares 4 1/4 inches this time and then make 2 HSTs using the method described above (stopping prior to trimming). 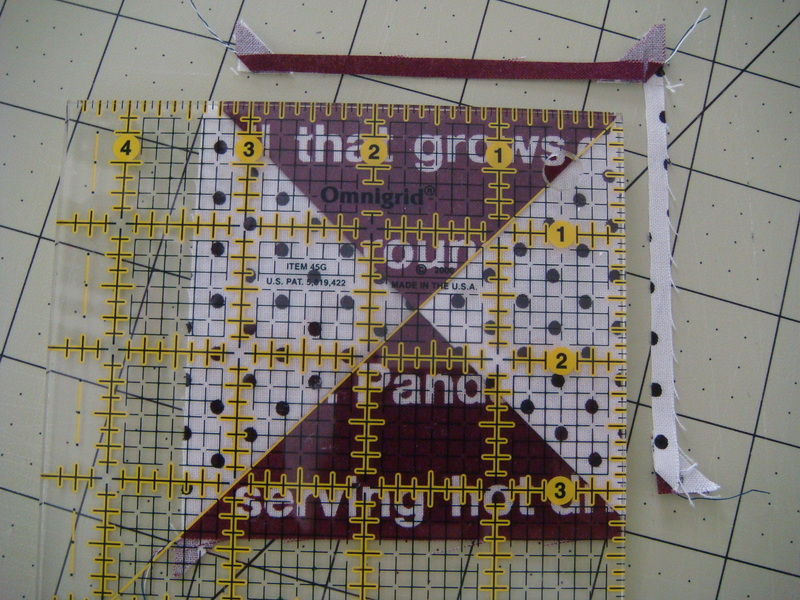 Before trimming we need to diagonally cut the HST as shown below and then join the pieces into hourglasses. One HST will yield 2 hourglasses. This is a good place to mention that when you’re joining things like this you should make sure the 2 seams are pressed in opposite directions and then “nest” the seams together as shown below. This is how you get perfectly aligned points. A pin wouldn’t hurt but I personally don’t use them for this. To trim, find the center measurement of your hourglass and line up your ruler there. Our hourglass makes this kind of tricky, but I want to keep it real. Half of 3 1/4 is 1.625. Eyeball it! It’ll be fine. Just make sure you trim about the same amount from each side so your center point stays centered. And there you have a nicely square 3 1/4 inch hourglass unit with 4 clean and strong sides. Please feel free to contact me with questions about this tutorial! I hope it helps. 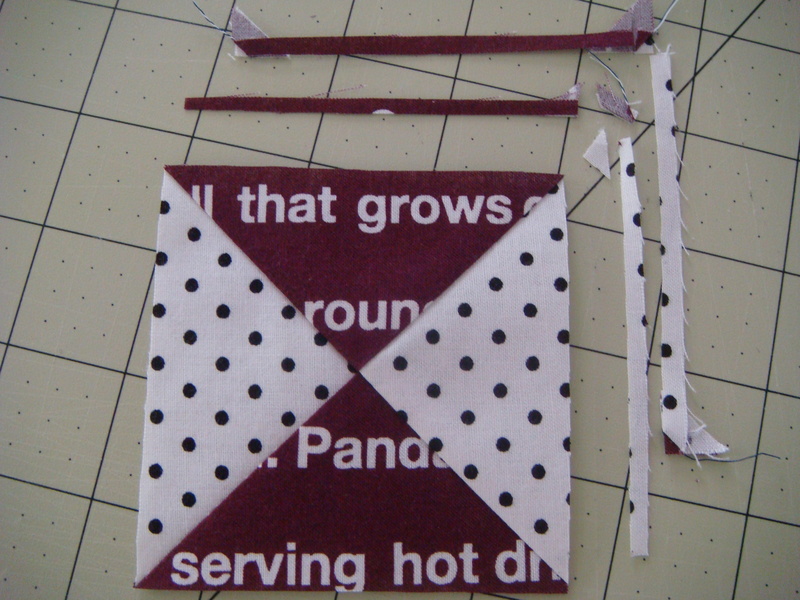 This entry was posted in Tutorials and tagged hourglass, HST, Tutorials. Bookmark the permalink. your HST and hourglass units are looking good. Can’t wait to see what you are doing with them. Thank you for your nice comments on my blog! 🙂 Collecting shirts is really great fun! So many nice checks, stripes and colors out there for free! I wish we had a thirft store in our town…or better not! Who knows how many shirts I would have collected then?!? Great tutorial for both!! Thanks! Sarah, I am amazed how much time and effort you put into your blogs to help others! Way to go… I am really impressed. I am learning new tricks from you. Awesome tutorial! Thanks for the math lesson, i hate math and it hates me, it kinda seems a little too easy now! Who knew i just needed to add 3/4 of an inch! Fantastic close up shots too! I’m a sucker for lots of pics, especially in a tutorial!